An essay In Memoriam for Ursula K Leguin. Peter named Science Fiction and Fantasy Writers of America (“SFWA”) Damon Knight Memorial Grand Master. For Nebula Weekend in Pittsburgh, Peter will be there for his SFWA recognition, on May 17th – May 20th, 2018. He is a guest at BayCon: May 25-28. BayCon is the longest fan-run science fiction and fantasy convention in the San Francisco Bay Area. Peter will be attending DragonCon this year. That’s August 30 – Sept 3. 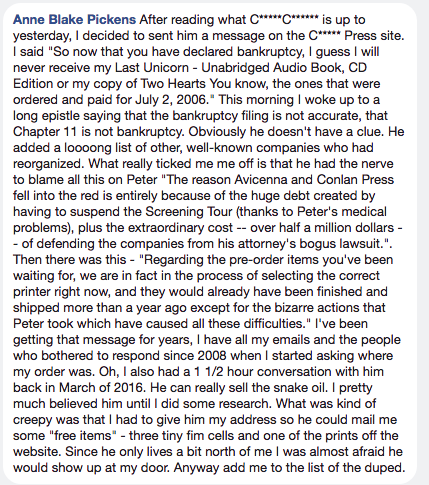 ALWAYS CHECK if a Peter/Last Unicorn product is legit! Sadly, customers have little hope to get their due without taking action. Undelivered sales made in 2005 are getting active complaints in 2018. While Connor has done this to everyone, and nobody knew how bad it would get at the time, it’s clear who deserves support now. The fight for Peter’s rights is a positive step for an active, working creator. ← Bankruptcy filed by Connor Cochran – alert for anyone awaiting merchandise from Conlan Press. 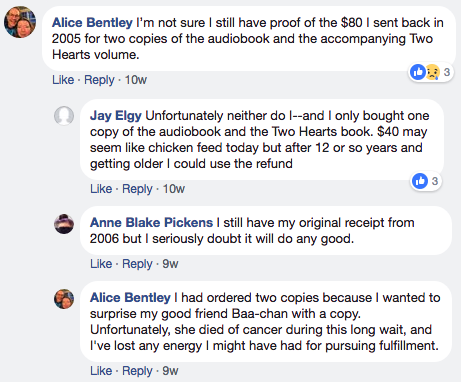 Just as a clarifying note – the ONLY social media for Peter in his own right is called “The Real Peter S. Beagle.” Both on Facebook and Twitter, it’s overseen, with input and responses from Peter, by a friend. Anything with The Last Unicorn in the name is either a fan site – and there are many – or are run by Cochran. But Peter doesn’t have any input or access to those. 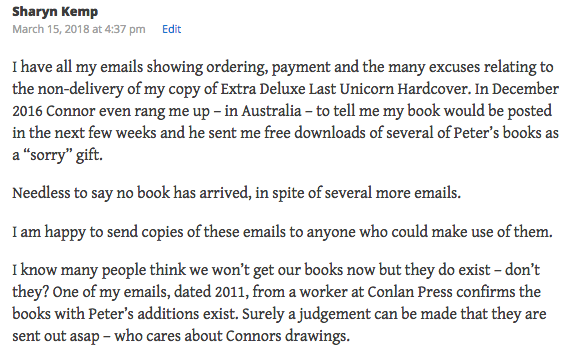 I also received the exact same runaround on the signed Deluxe Last Unicorn Books. Peter already finished his hand written unique chapter, which is the reason why we bought those books in the first place. We were just waiting on Connor’s sketch which was taking years. I even said several times to forget the sketch, we never wanted that part anyway, but they straight up refused to send me my book. They took my money then changed the terms of the deal and then it all became the Connor Cochran Deluxe Sketch Book That Will Never Be Completed And Connor’s Neverending Parade of Excuses. I bought this as a surprise gift for my wife who was a huge fan back in 2008. She passed away last year from cancer. Connor Cochran not only cheated me of my money but he stole that unique gift and that moment in time that’s never coming back. Connor Cochran has stole from me something that cannot ever be repaid. I will never forget or forgive. So glad to see this update. THANK YOU!